New Model Wizard interface and its huge range of model patterns. 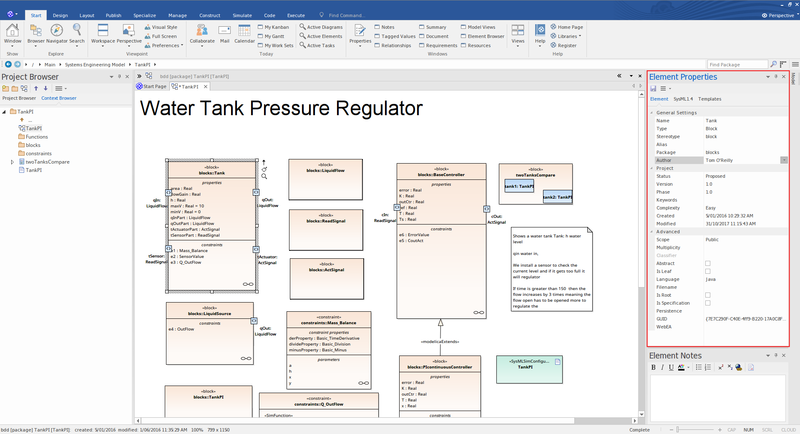 New Inline Diagram Reader, enhanced Properties view and Context Browser. Improve decision making and build rule based, standards compliant models. Cut out the noise and stay tightly focused on your current modeling task. With so many modeling languages and capabilities built into Enterprise Architect it has previously been difficult to find the right approach and keep focus. All that now changes. It is now very easy to pick a modeling domain and stay tightly and productively engaged. Quickly and effectively narrow down the scope of tools and options available to their exact modeling requirement or scenario. 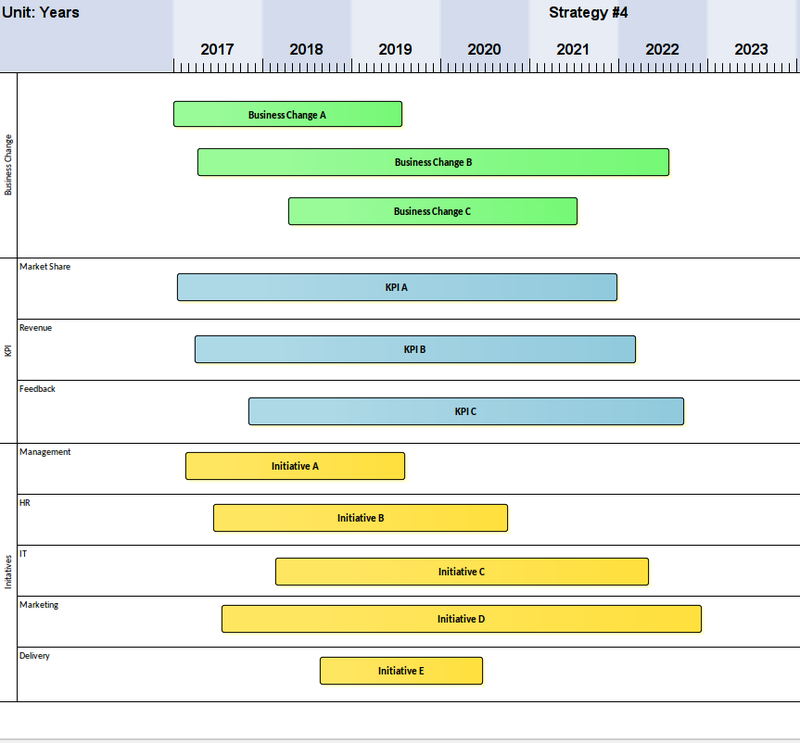 To accomplish this goal, version 14 includes a new and improved "Perspective" feature that tailors the overall modeling capability to a specific set of technologies and implements a robust and user-configurable meta-modeling capability that allows for very fine definition of custom viewpoints and modeling tool sets. Coupled with these changes come a huge range of new model patterns and guidance notes that allow the modeler to quickly build accurate, focused models with minimal "noise" and maximum fidelity. Quick access to everything unique about a single element. A context driven window into a single element's structure. Works well with the Project and Context browsers, the new Property windows and the new Features window. Seriously overhauled to create rich, flexible and easily switched sets of related technologies. Easy to focus the available model patterns, technologies, diagram types and to the precise set. Avoid the significant "noise" that arises from having multiple technologies all competing for attention. Hide complete Perspective sets or individual technologies using the new customization wizard. Hiding a Perspective now only removes it as an available tool, while all diagrams that already make use of the hidden technology will still render and work as normal. A new Perspective drop list at the top right of the application, coupled with the re-worked Portal bar provide a rapid and effortless mechanism for switching between technologies and swapping in and out the necessary tools at the right time. For your convenience, selecting a Perspective set automatically brings up the modeling wizard, ready for inserting a rich set of new modeling patterns on which to build. The Model Patterns Wizard and the new Diagram dialog also allow for swapping perspectives on the fly, making it easy to find and use the exact modeling tools required. Out of the box, version 14 includes many Perspectives targeting Business, Software, Systems, Architecture, Project Management and more. It has been built on the belief that is is easier to rapidly switch between domain focused sets of tools on an as needs basis, than to provide a mixed set of technologies and tools that try to address ALL possible modeling scenarios. Leverage a rich set of modeling languages, patterns and more built directly into version 14.
Business sets for Strategy, BPMN, Business Analysis & etc. Build your own perspective sets! Need something a little different or customized to your specific liking? In addition to the system defined Perspectives, modelers can now define and implement their own Perspectives tailored to match their exact requirements. 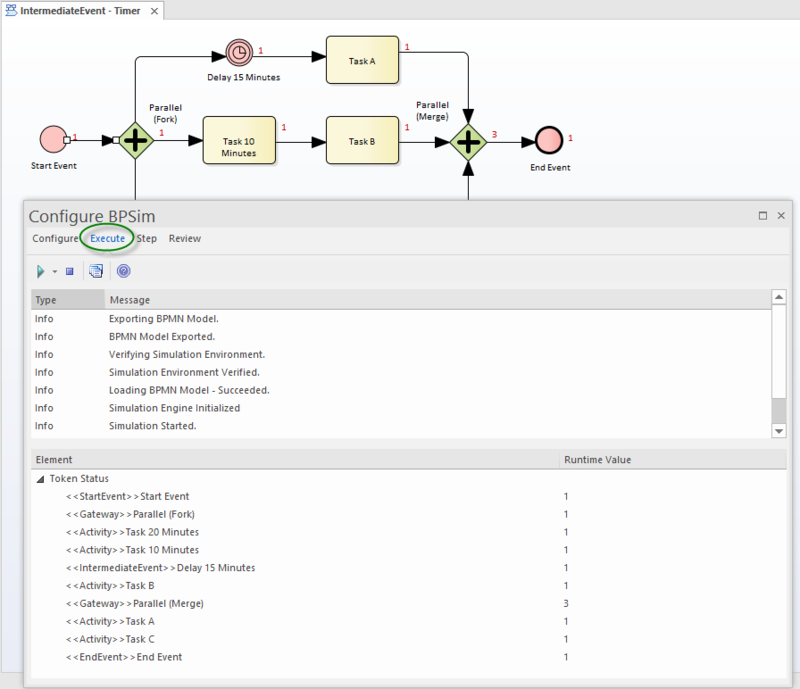 If you need a Perspective that combines BPMN and SysML for instance, you can do it with ease. Access a rich set of functionality in the Portals bar or set up watched models; the redesigned Start Page is 100% focused on getting you back into the saddle and doing serious modeling! A new docked window in version 14 that lives in parallel with the Project Browser. 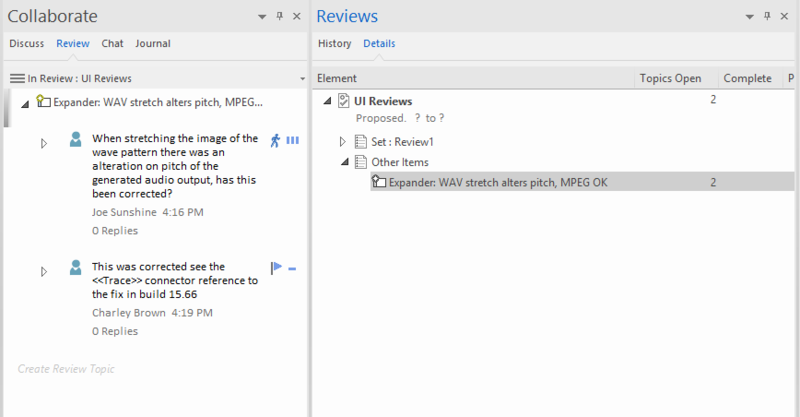 Reduces the "noise" of the Project Browser proper by only showing the content in the currently selected package. This greatly sharpens the focus on the current work set and cuts away the information not currently necessary to modeling. It is the ideal companion to the Navigation Bar. Between these two UI components the modeler can rapidly find and work in a simplified view of the project structure that includes all the necessary power to model accurately and quickly, but also removes the visual noise associated with the full Project Browser viewpoint, especially in a large model. Take control of the Enterprise Architect user interface with the updated Portals bar. Shortcuts and commands to get you where you need to be, quickly and effectively. The Portals bar has been reworked to support the new Perspectives and Workspaces functionality. 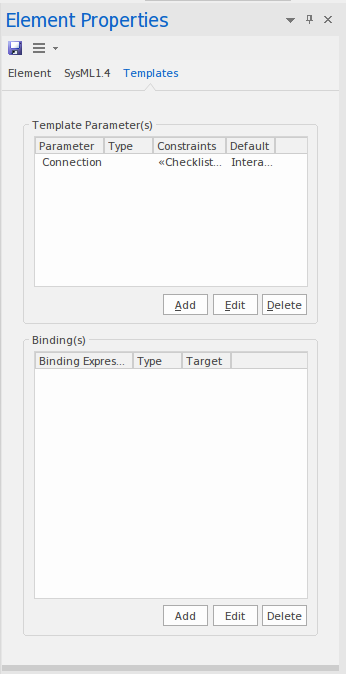 Commands and actions already available in the main ribbon bar have been removed and the focus is now on quickly and efficiently switching between logical perspectives. The Context Browser is the ideal companion to the Navigation Bar. 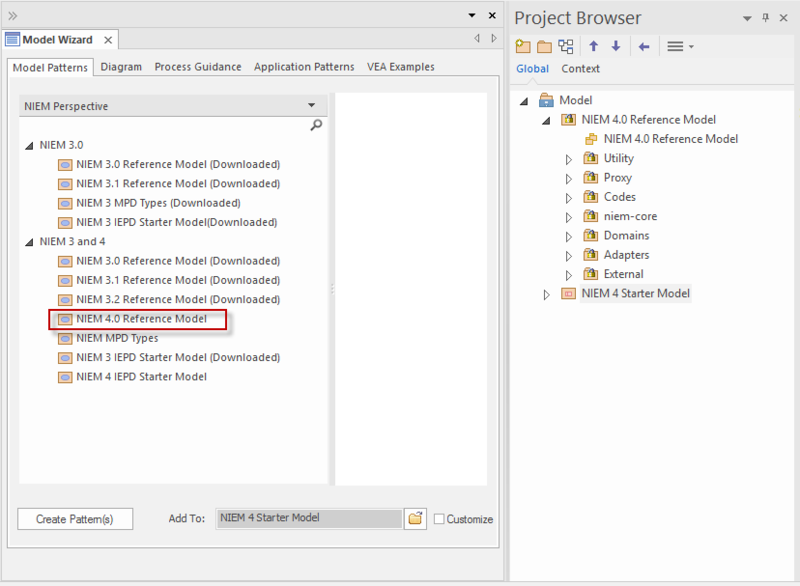 Between these two UI components the modeler can rapidly find and work in a simplified view of the project structure that includes all the necessary power to model accurately and quickly, but also removes the visual noise associated with the full Project Browser viewpoint, especially in a large model. Get your work environment organized and quickly switch between tool suites. One click access to the tools and capabilities you need to model, build and deploy. 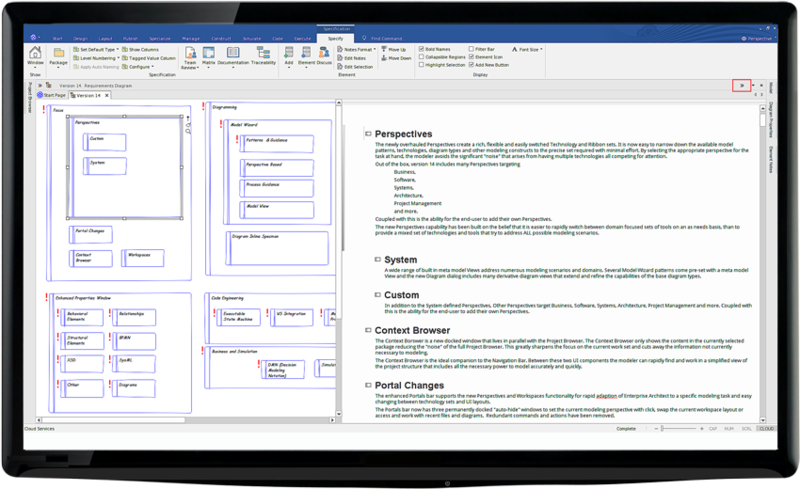 The Workspaces capability in Enterprise Architect 14 provides a generous set of commonly used window and tool layouts that let you quickly assemble a powerful and task specific desktop layout that puts the best of Enterprise Architect at your fingertips. If the built in sets don't quite meet your requirements, build your own workspaces to totally personalize your working environment. Workspaces can be accessed from the Portals bar or through the "Start" Ribbon. Dive into the model, connect with team members, set up the work environment and access tutorial and other informative resources. Or configure a rich set of preferences and visual styles. 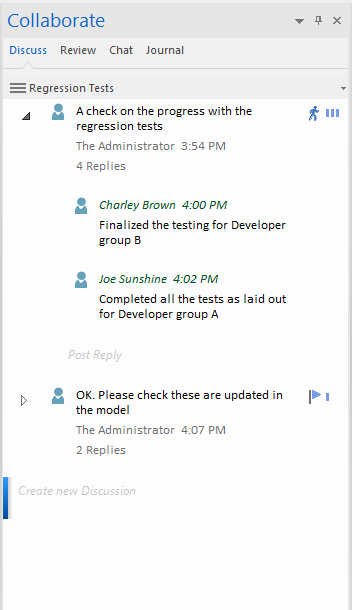 Connect with your fellow modelers, check the model calendar, discuss, review and chat. 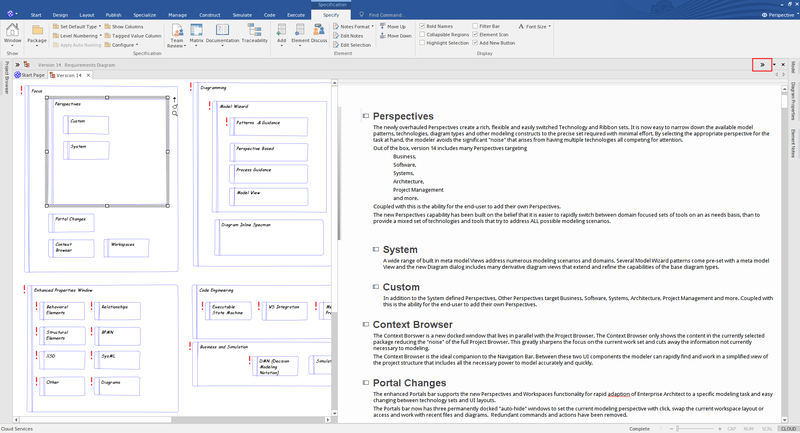 Find recently modified diagrams and elements, access your personal journal and consult a variety of educational material designed to get you quickly up to speed with modeling in Enterprise Architect. Access the tools and commands commonly used when building and elaborating a model. Work with model Packages, the "containers" or "storage units", within your model. 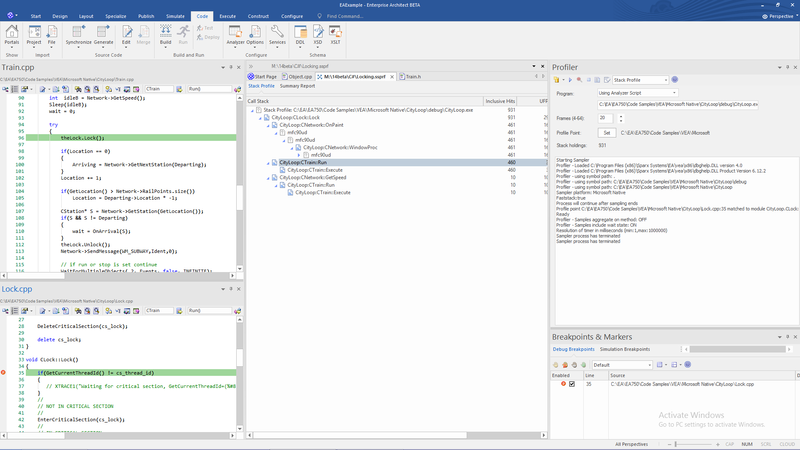 Access the Specification Manager for a unique but familiar text based interface targeting model development and refinement. Switch to List and Gantt views for a full 360 degree view of your project's current state. 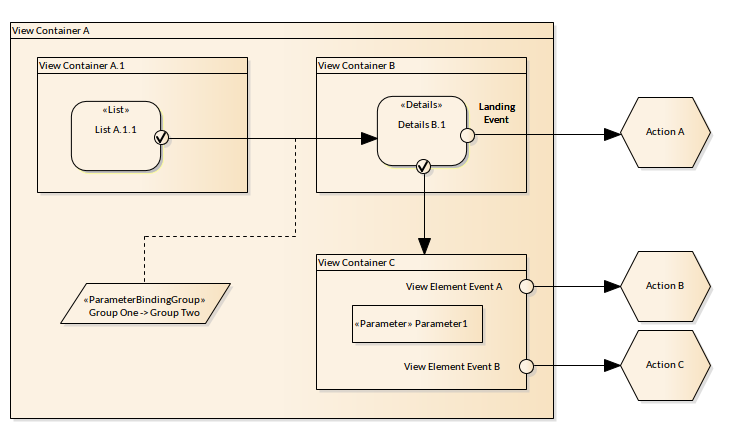 Work with Diagrams, the visual interfaces or "windows" into your model's structure. Visually build and adapt your model, adding, refining and switching viewpoints at the press of a button. The Layout Ribbon supports tools to aid you in refining your visual representation of the model. Align, format, color, filter, explore, select, copy, paste, customize and otherwise refine. Your "Window into the model's structure". "Hand Drawn" or "Whiteboard" modes to emphasize a diagram's "ad hoc" or informal nature. Swimlanes, roadmaps, themes and other specialized drawing to better convey an ideas. Highlight and suppress elements based on a variety of properties and key terms. Put your model to work. ...that help you communicate the purpose and structure of your visual models to a wider audience. 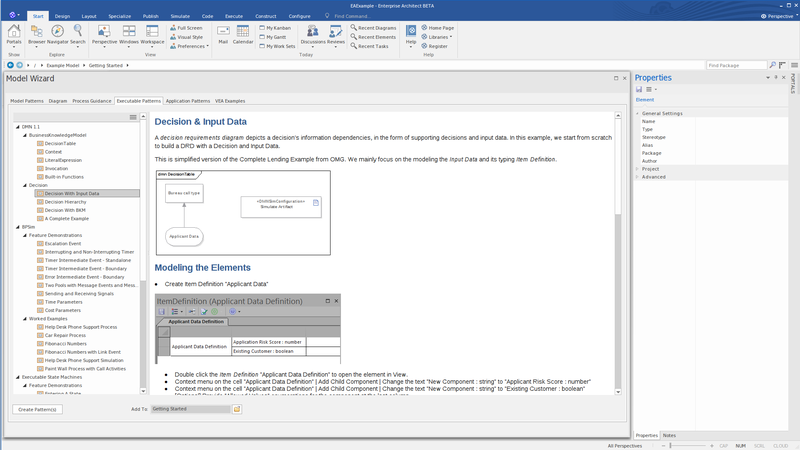 In addition to familiar document formats you can also publish model content in formats such as XMI, for interchanging models between different projects and even between different tools. The RAS service lets you publish and consume model content to/from a shared model repository. Re-use your models across multiple engagements, create a library of model assets that you can call on as needed. Numerous Simulation options let you put your behavioral diagrams to work so you can examine their behavior and experiment with many different operational parameters and configurations until you find the sweet spot. Stay in touch. Work together as part of a team to rapidly realize your project's goals and objectives. The new and enhanced collaborative features in Enterprise Architect 14 help you work together as an effective team. Chat, discuss and review design decisions and model solutions. Keep a personal daily Journal to record ideas, notes and other useful information. An informal and relaxed way to raise issues, discuss general points and communicate with team members concerning issues not directly related to specific model items. Stay on top of the model as it develops. Talk about specific model elements, raise issues, suggest refinements, highlight important impacts. Get everyone on board to review and formally discuss the model. Involve your stakeholders, involve WebEA users, involve customers, get feedback and ensure your project is on track and moving forward. Throw away the scraps of paper and personal notes to self! The new daily Journal lets you type in a personal stream of consciousness - ideas, comments, notes, suggestions, events, to do lists and more. A great way to keep the momentum flowing day to day. Superseding the Team Review, this facility now focuses on being a library of shared documents, files, guidance material, specification documents, informal notes, binary resources and more built into your model. Press and run simulations of Activity Graphs and more using Events. 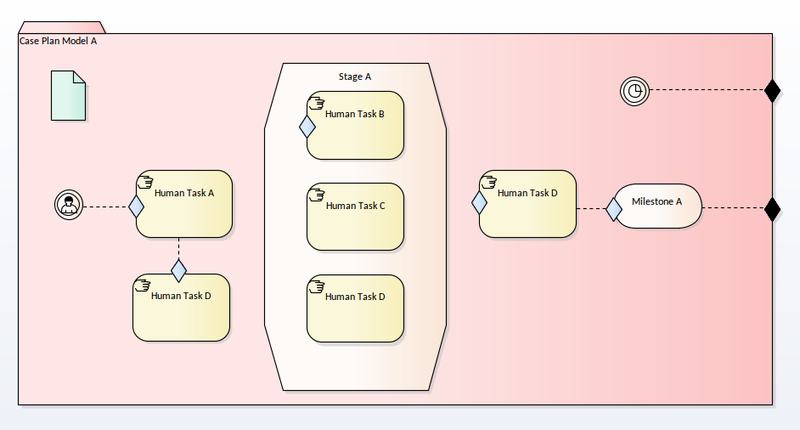 Visualize Process diagrams. facilitate design, reduce risk, analyze performance, conduct what-if analysis, manage resources and more. 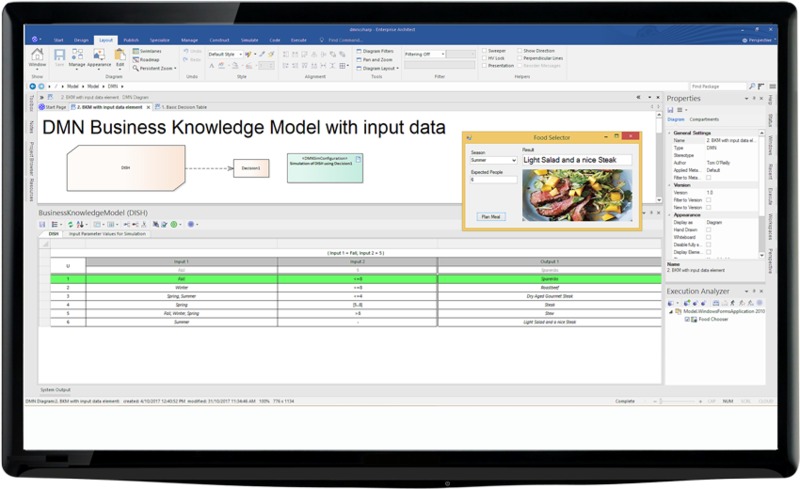 Bring your decision models to life with your own input data. Watch branch points, decision tables and logic in action as outcomes are reached. Get off the starting blocks quickly with patterns that model the constructs for creating, editing and generating executable code for the simulation of state machines. Generate compelling model simulations of complex mechanical, electrical, electronic, hydraulic, thermal, control, electric power systems. With Enterprise Architect 14, all Element compartments are turned on by default. Meaning if you drag and drop a child element onto a parent, a structured compartment is created and the child element is bound to the compartment. 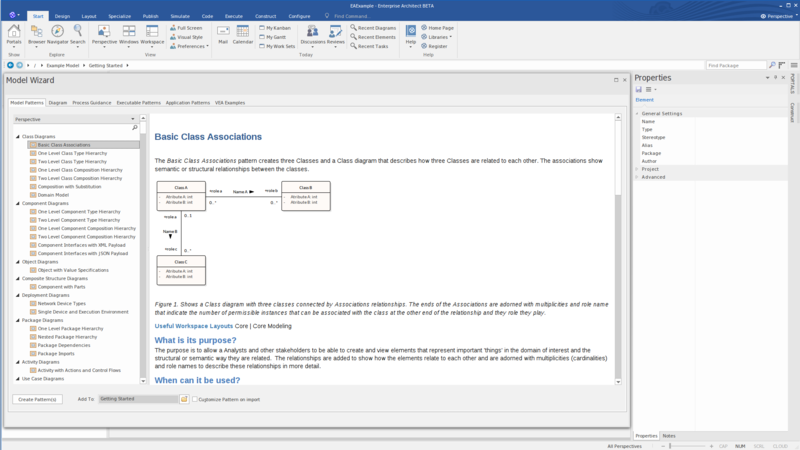 Some significant changes have been built into the Diagramming functionality of Enterprise Architect 14. In addition to the detailed and rich set of Model based patterns and guidance, a new meta-model driven View capability has been added to allow very precise and accurate refinement of a more general diagram type into one that is targeting a particular scenario or domain. 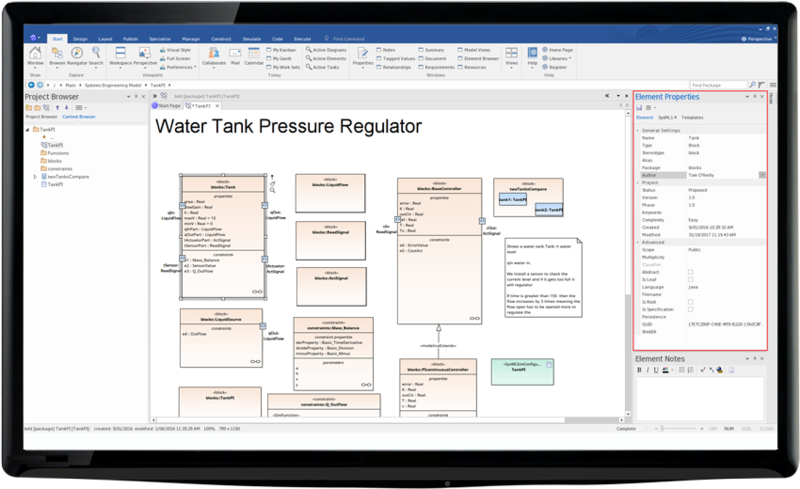 New and innovative feature that allows the modeler to both view the visual diagram content and to read and work with the element name and notes in a familiar document centric manner is also included in v14. Showing both aspects together significantly improves both the quality and the accuracy of models, while engaging multiple viewpoints concurrently for the most effective result. The inline Diagram Specification Manager is accessible by clicking the « button in the right hand side of the diagram caption bar. The Model Wizard has been available in Enterprise Architect for many years, however in version 14 it has received a huge update. The goal has been to greatly enhance the modeling experience making it easier to find and use the right modeling approach for a particular domain and purpose. A new View based UI, huge selection of model patterns with detailed guidance and references, perspective based filtering and use of meta-model driven model views together vastly improve the modeling experience. One of the real highlights of version 14 is the rich and highly detailed set of patterns and frameworks that have been incorporated into the Model Wizard. From basic modeling tasks, to Business, Systems, Architecture, Project Management and more, the new model patterns have solutions to kick start your design process. In addition to the pattern itself, each selection includes a detailed set of notes, references, advice and graphics depicting the pattern as initially created. Getting started with a particular modeling view or task is now so simplified and focused that it is much easier to get the right tools in place to quickly and effectively understand how to best maximize the value of a particular pattern. A combination of Activity chart and checklist elements, Process Guidance patterns are intended to step the modeler through more challenging tasks, by providing a repeatable and easily followed set of steps that have a well defined goal. In future these patterns will include a wide range of topics and tasks to make advanced functionality within Enterprise Architect easily accessible. Work with only the technologies and tools that are applicable. Cuts down the list of available technologies, patterns and diagrams to a particular scenario. 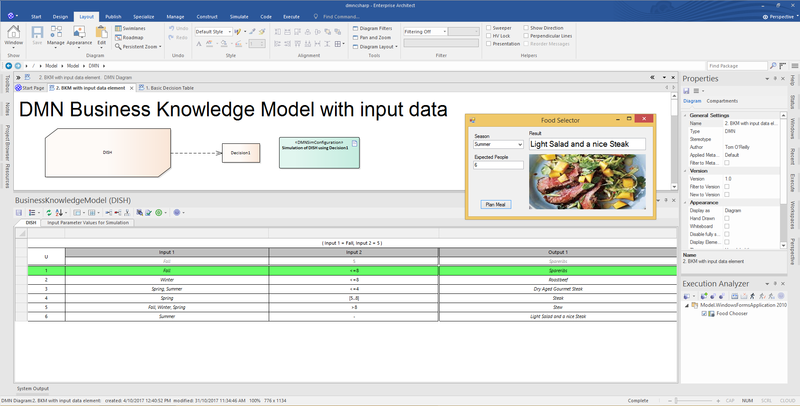 Using the Model Wizard or new Diagram dialog no longer presents the modeler with a vast range of possible options and technologies. By swapping between perspectives the right set of tools is immediately front and center. Enterprise Architect now intelligently filters technologies so that the list of toolboxes, model patterns and diagram types is tightly focused and task oriented. It is also important to note that using the Perspectives differs to de-activating and activating technologies. A Perspective does not de-activate a technology - just hides it from view. This is very important as it means that a model can contain many different domain specific technologies and diagrams, which will continue to render correctly and supply the correct properties and toolboxes etc. The Perspective simply suppresses the visibility of technologies - it does not de-activate them. Work with several perspectives in the course of a day's work or stick with one tool set, such as BPMN or SysML, for the duration. The goal is to make swapping perspectives easy and to make each perspective address a particular concern. From the Design Ribbon bar. DataType elements have Details tab on the Properties dialog. 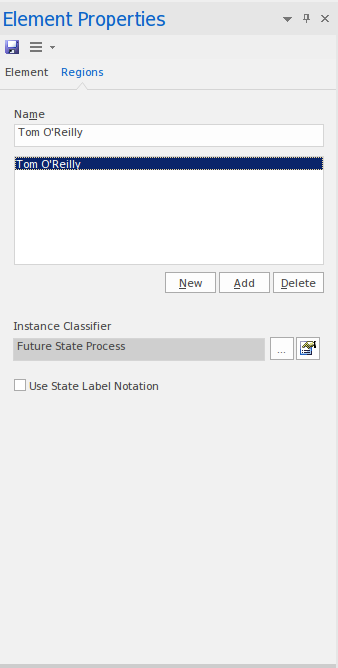 UML BehavioredClassifier elements can define a ClassifierBehavior. GeneralizationSets display disjoint and covering constraints in the label. New Reception tab can be used to create a Reception by binding it to a signal (accessible via Design Tab | Element Panel | Features button | Receptions). Working in a team environment just became simpler. You can now receive a visual representation on a diagram for the status of an elements lock. Simply activate "Element Lock Status" in the diagram properties. 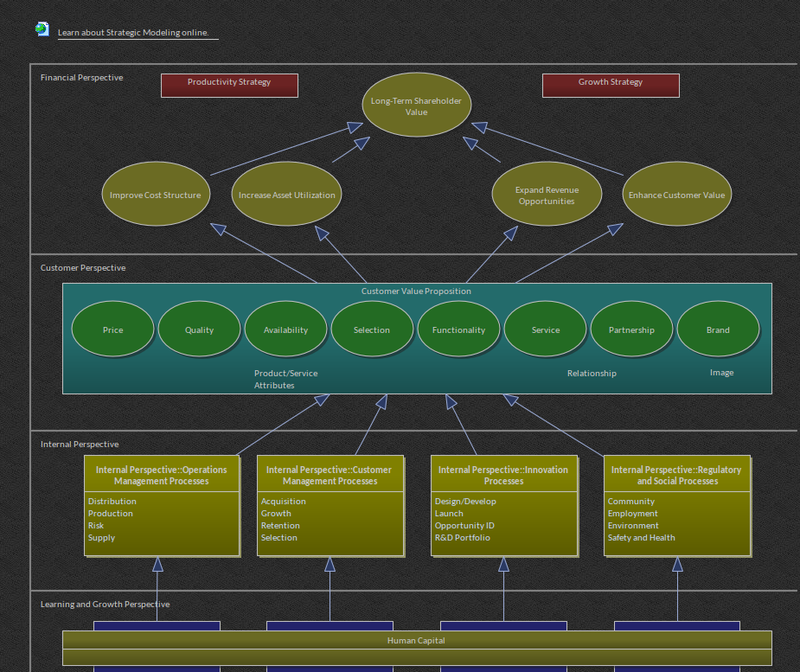 There have also been some minor changes to the Enterprise Architect default theme. Now included is an extremely powerful and flexible Views system based on both system defined and user defined meta-models. 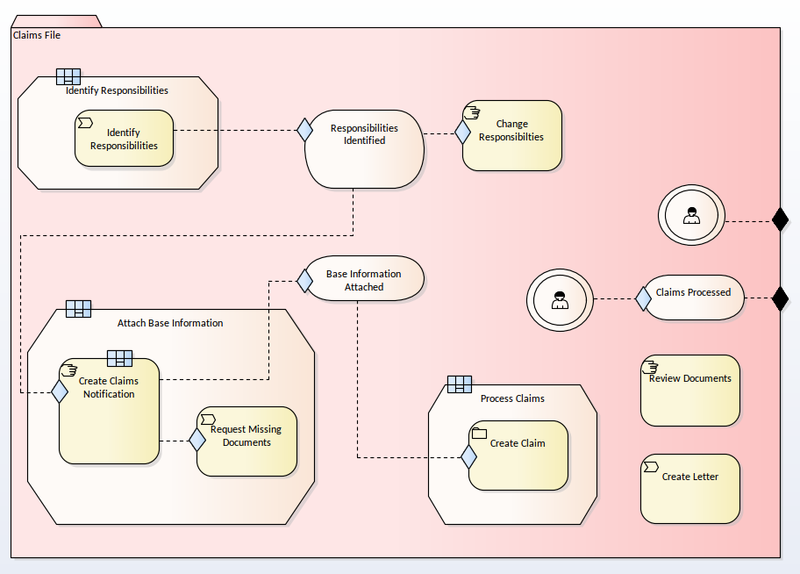 The Views system is intended to provide highly focused diagrams that limit the number of elements and connections available to the minimum required to achieve a specific task. 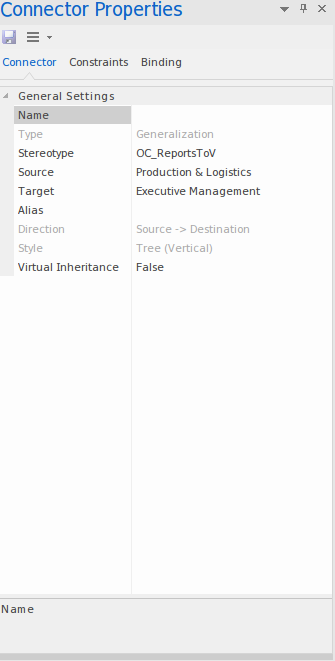 For example, a Hierarchy View imposed on a Class diagram may limit the only element available to Class and the only connector to Inheritance. By using the Views system to guide the modeling palette and relationships available, the modeler is ensured of building tight and purposeful diagrams that use only the required elements within the current modeling context. Cutting out the noise and reducing the set of constructs available is a great way of making sure a design is addressing the intended purpose and avoiding extraneous elements that may negatively impact the readability and correctness of the model. In addition to limiting the available palette, the View system also allows the modeler to enable a diagram filter that will gray out any elements that are not part of the current view set. This allows the modeler to correct any parts of their model that don't meet the purpose of the selected View, or to filter out elements that are required to be there, but do not form part of the current modeling goal. The diagram properties dialog now includes a new drop list of available Views for the currently selected diagram type. Selecting one of these Views will reduce the palette of constructs available and limit the entries in the Quicklinker. Modelers can easily activate a View or even remove one if necessary - the actual model content will not change. 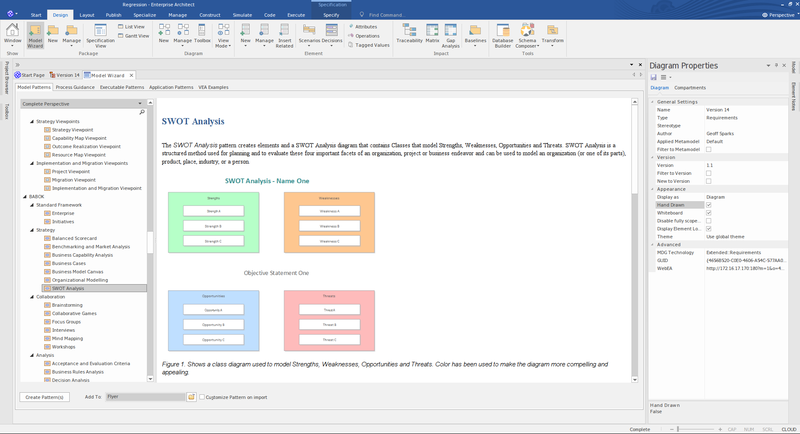 There are a number of different Views that offer different palette sets and focus goals for diagrams types such as UML, SysML, BPMN, UAF and others. If you have the goal of modeling a simple activity diagram with no advanced features, the Simple Activity View under the UML Activity Diagram section may be a better option than using the full Activity Diagram set. Enterprise Architect version 14 comes with a wide range of built in meta model Views that address numerous modeling scenarios and domains. 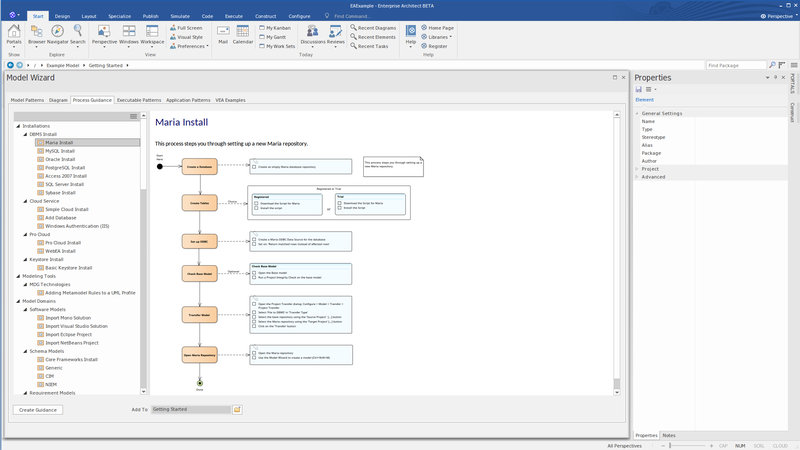 Many of the Model Wizard patterns come pre-set with a meta model View and the new Diagram dialog includes many derivative diagram views that extend and refine the capabilities of the base diagram types. 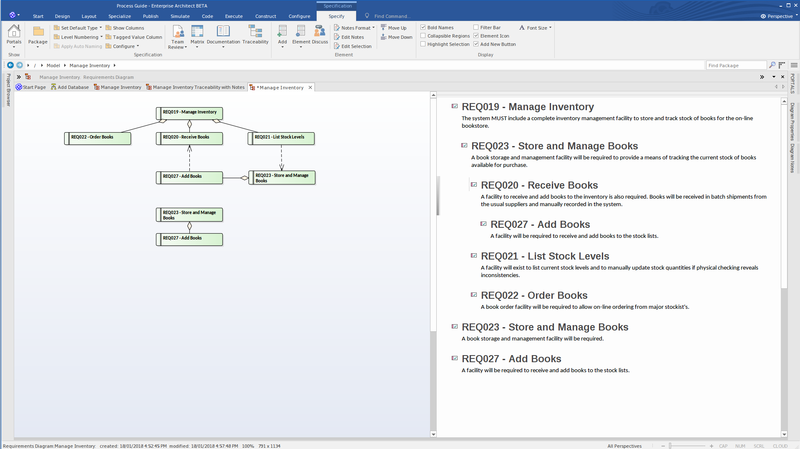 In addition to the system defined meta-model based views that Sparx distribute with Enterprise Architect 14, it is also possible for the modeler to create their own meta models and easily add them to the current model, where they or other modelers may then apply them to various diagrams as needed. For example, you may define a specific meta-model set that addresses the needs of Requirements modeling in your organization and then mandate that all Requirements diagrams use that Metamodel View. 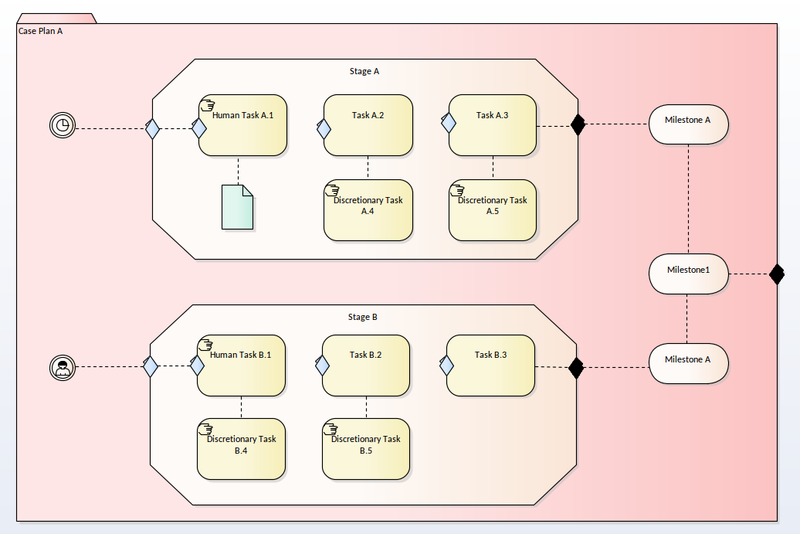 The new Diagram Specification View creates a running narrative of a diagram allowing a modeler to effectively read the diagram's story. The tool gives an instant picture of whether the diagram is complete and meaningfully annotated. It provides a welcomed view for those who prefer text to pictures. Docked Properties Windows for almost everything! With the increasing number of specialized modeling languages and domain specific modeling constructs, the number and types of specialized properties and settings associated with various elements has dramatically increased over the years. To help modelers exact the maximum benefit from their modeling time, version 14 has brought together all of the various custom settings and properties that any particular element may support and made them available for editing in a vastly updated Properties docked window. This update includes a wide variety of new custom "sub-panes" that provide detailed configuration settings for the many different kinds of elements and technologies supported by Enterprise Architect. By collecting together the various common and specialized property sheets into the docked Properties window, the modeler now has the opportunity to quickly and accurately set both the common and often used settings together with the more advanced and specific settings that only apply to certain element types. 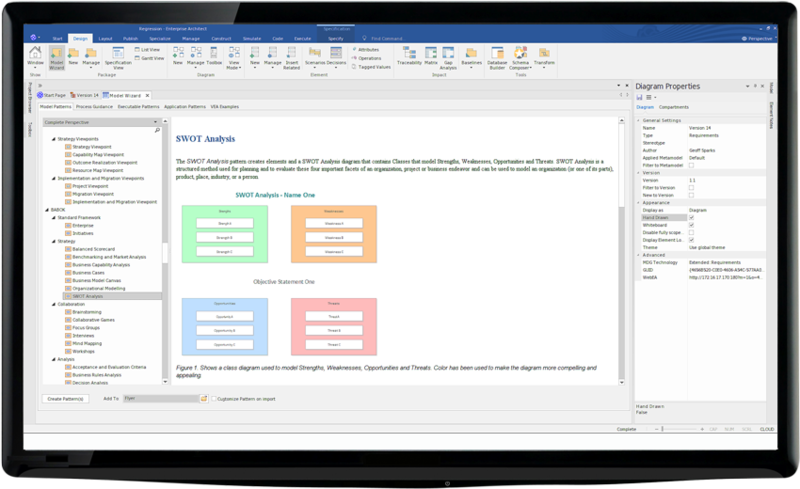 With the inclusion of property settings for relationships and for technologies such as BPMN and SysML, the new property window streamlines model development and ensures the best possible design choices can be made with ease. To further enhance the experience, the default tab style has changed to a "Pointer" style and is placed at the top of the window. This provides a very clear and easily accessed method for reaching the various property sheets that are active for any given model element type. A reworked method of working with element features. The core list component of the features dialog has been implemented as a docked window and the actual properties for individual items integrated into the docked Properties window. This provides a more seamless and easily accessed method for editing multiple features and working with operations and receptions. Another huge productivity boost is the inclusion of a new "Interaction Points" window in the Attributes, Operations and Receptions window. View, manage, add, remove and generally work with embedded and structural elements that form the primary interaction points of complex, composite elements. Ports, Parts and other special embedded elements are now easier to create and configure. 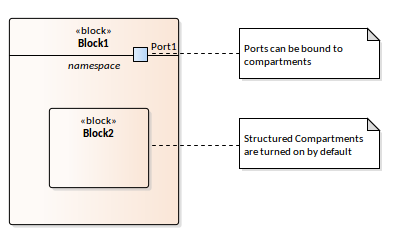 In conjunction with the expanded toolbars for many diagram types to now include these embedded elements as toolbox elements, creating complex designs with Ports and owned Properties is a breeze. New docked window to support display of basic Risk and Effort types and descriptions. 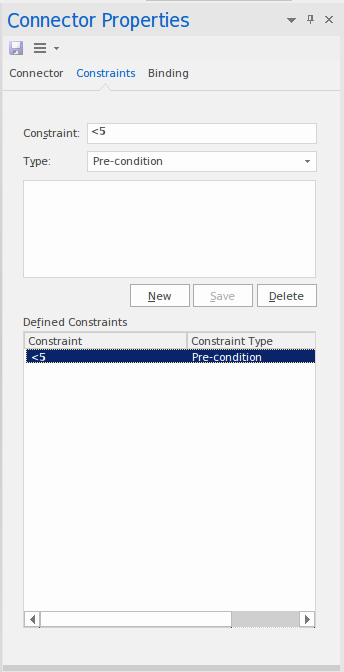 A major new docked window that collects the internal requirements (also called Responsibilities), Constraints and Scenarios for an element, in a convenient and easily accessed form, that encourages easier browsing and editing of various characteristics of an elements responsibilities and behaviors. Replacing the main view "Scenarios" window. It provides a simpler but more effective mechanism to integrate with element behavior. It also integrates with the Element Browser and various diagram level items in behavior compartments. To further enhance the modeling experience, the docked properties window now includes support for Relationship properties. Selecting a relationship in a diagram will allow the modeler to access and configure both common and advanced relationship settings for the currently selected relation. As an example, modeling state transitions is now much easier with a docked property window tab devoted to setting guard and trigger information. The ability to quickly build accurate simulations and state machines is now greatly enhanced. The new docked properties window has support for many advanced behavioral features, including where appropriate, element parameters, behaviors, state regions and much more. Take charge of model based maintenance issues, tasks and changes. A set of new docked windows to support display and edit of maintenance items (change, defect & etc) has been included. Works in conjunction with the docked Maintenance list, the element browser and elements on a diagram displaying their maintenance compartment. New docked window to support display and edit of Resource allocations for elements. Provides a flexible and common mechanism for updating resources from element browser, diagrams (showing resource compartment) or from the Resource Allocation list. 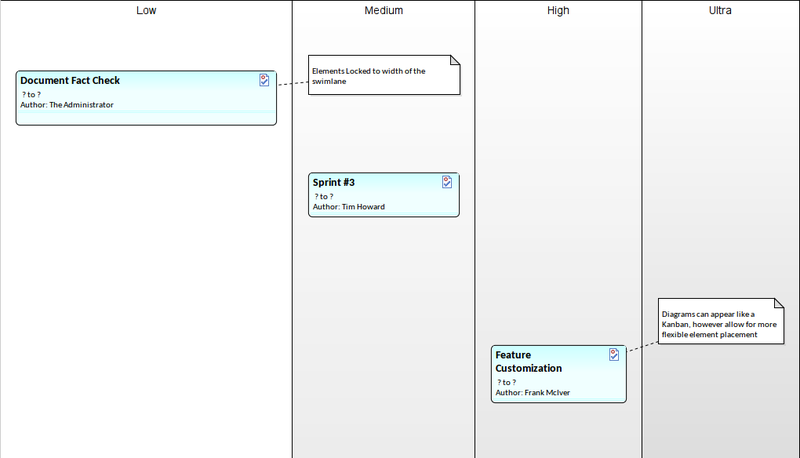 Integrated with Gantt charts. 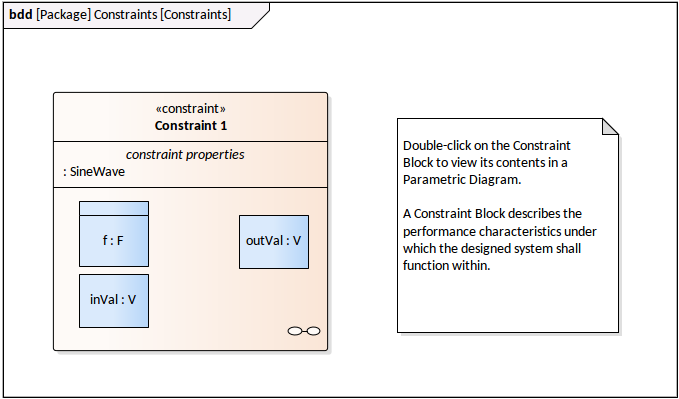 Diagrams now show a simple properties window when they become the current context item. You can now set a few important properties such as the diagram name easily in this window. It is also possible to select a View (limited toolset and relationship set) dynamically to quickly focus on a modeling intent within the current diagramming context. Commonly used properties have been included to maximize the usefulness of this new window. BPMN elements now have customized sets of properties in the docked property window. By reducing the properties available to the core set for a particular BPMN type, the modeler now has a much clearer and easier task when it comes to setting up and configuring their BPMN models. SysML elements now have their element/stereotype specific properties exposed through a custom property sheet designed to provide immediate access to the most relevant and useful SysML properties for the selected element. 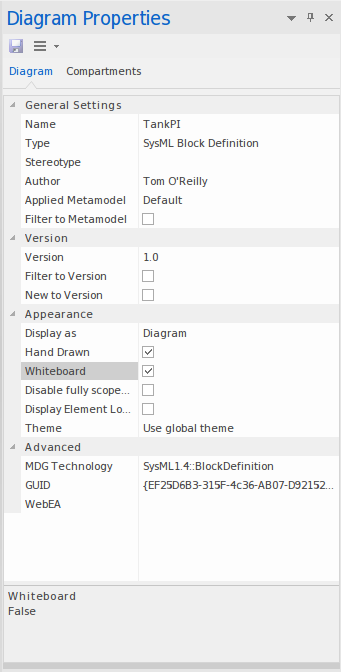 XSD stereotyped elements now support their appropriate configuration dialogs as separate docked window tabs, allowing the modeler to quickly focus on the task of rapidly building accurate XSD models. Structural elements are also well represented in the new docked properties window with support for such things as templates and Property configuration details. Technologies such as ArcGIS also support customized property sheets that allow for rapid and accurate configuration of the most essential domain specific settings that are applicable to an element/stereotype within a technology. BPSim has received some significant usability enhancements that make this feature more engaging and accessible. The ability to step through and play back simulations at varying time scales greatly improves the visibility of how the simulation executed and the values and events that occurred during the simulation. New, extensive and highly effective support for the Decision Modeling Notation standard. Built from the ground up, the new support for DMN is extremely comprehensive and provides modelers with an exciting and tightly integrated new feature that supports rule based decision modeling in a standards compliant manner allowing for various simulations, integrations and code generation outputs useful for defining rules and for generating the implementation code to evaluate those rules. Notation support inclues hierarchical rule sets, and highly effective and specialized editors to manage and evaluate rule sets. Configuration tools and more allow the modeler to integrate DMN sets within simulatable state charts to procedurally govern state changes according to DMN defined rule sets and hierarchies of rule sets. Greatly enhanced support for NIEM and the new NIEM 4 specification. Improved modeling and schema generation capabilities make Enterprise Architect 14 a solid choice for using NIEM as a core modeling and data definition protocol. Read more about Enterprise Architect's NIEM support here. 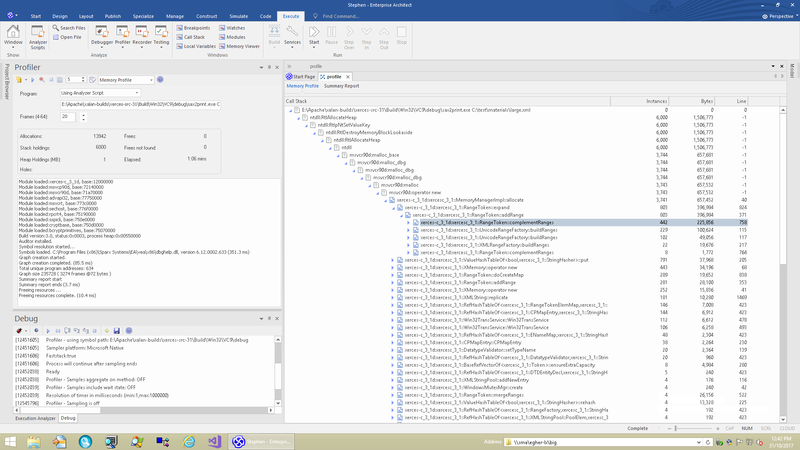 State machines can be exported into more specific locations and namespaces, and to be automatically added to Visual Studio projects, Java namespaces and other targets for inclusion directly within a user development project. The application profiler for Windows based C/C++ executables has been significantly improved to provide faster and more comprehensive information. The app profiler is used to determine what code has executed during a particular scenario and how often particular parts of the executable are being accessed. As a result, the app profiler is performing the dual function of monitoring both coverage and bottlenecks. It is a great way to explore new and unfamiliar code, as the resultant reports quickly show how an application is working and where it is spending most of its time. The application profiler has become a core component in the development tool chain with which Enterprise Architect is built, tested and optimized - both under Windows and under Linux | Mac / WINE. A new and very useful feature in Enterprise Architect 14 for those profiling and debugging source code and executables is the "Stack Profiler". As the application continues executing and the marked position is accessed from a variety of places within the running executable, a very detailed and useful picture is built up showing hot spots and usage scenarios for a particular point in code. The Stack Profile report, like the Memory Profile report, is displayed in "reverse stack" order. This means that the root of the report is always a single node (in this case the marker) and the tree then fans out to show all the various places the marked position has been accessed from. "The Stack Profile report is another incredibly useful tool in analysing and understanding how and application works and in particular, how some piece of code is used within that executable." Version 14 includes a powerful and extremely fast memory profiler that efficiently tracks memory allocations and de-allocations in real-time and produces a comprehensive report of memory activity. Aimed at the Windows C/C++ executable it can quickly pinpoint memory bottlenecks, leaks and other issues during execution. It can be dynamically turned on and off to pinpoint particular usage bottlenecks or leaks. Like the Stack Profiler, the Memory Profiler uses reversed stack hierarchies to easily move from the one common point (the run time memory allocator) through the various calling stacks to demonstrate where, why and how memory is being allocated and used. Also like the Stack Profiler, the Memory Profiler works under both Windows O/S and Linux|Mac/WINE implementations - although the WINE implementation is slower. Version 14 includes improved interaction with Microsoft Visual Studio. 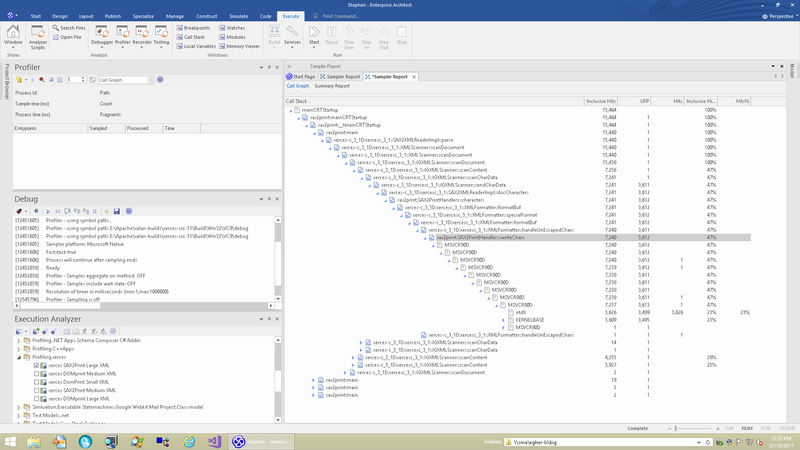 It is now possible to select a Visual Studio solution file and have Enterprise Architect import all the dependent projects in the correct dependency based order to ensure a complete and clean import. Now the power of the Sparx Systems Keystore has been built into the Pro Cloud Server. This allows added flexibility to check out a key across a HTTP connection from anywhere in the world. The Keystore has also been updated to handle our new versions of Enterprise Architect including the Professional Floating license and the new Unified Edition keys. Both Oracle and SQL Server (latest versions) can now be used to support Row Level Security in cloud based models. This means that models may be securely partitioned so that only privileged modelers or staff can access specific areas of the model, while ordinary modelers and/or customers and clients may only see a smaller prescribed section. 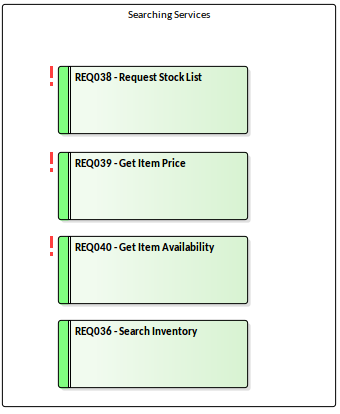 Row Level Security is implemented at the database level and effectively limits the information a modeler or user of Enterprise Architect can access, even if the user writes ad hoc custom queries. Because the restrictions are tightly integrated into the database, even using custom SQL does not allow the modeler to view the restricted level information. Row Level Security is enabled by running some additional configuration scripts on the database and setting up multiple logon accounts that the Cloud Server will use to partition the model. Depending on the logon credentials used to access a model (at the cloud level, not the user level), the amount of information available will vary. On the client side, admin users can set security/visibility levels on package hierarchies to effectively hide content from non-privileged users. The Pro Cloud Server is now also being offered in license packs based on number of concurrent users. While the full version of the PCS supports unlimited access, this new restricted mode is a cheaper alternative for companies and modelers wishing to use the advanced PCS features but have a limited budget. Sparx Systems are offering customers who have registered (current) licenses of Enterprise Architect the option to install a free copy of the Pro Cloud Server with a limited number of licenses (based on the customers current pool of registered licenses). For registered users with more than 5 current licenses Sparx will offer a PCS with WebEA capability equal to the number of registered licenses up to a maximum of 25 users. Offer is valid on a per company basis. A lightweight properties window that can show concurrently with a diagram to enhance model exploration and limit forward and backward navigation. Recommended for PC's and tablets in landscape mode. Not recommended for Phone. The Pro Cloud Server family of Apps now includes a new modular integration capability that is tightly connected with Enterprise Architect 14. The Integration modules are built into the Premium editions of the Pro Cloud Server and accessed with Enterprise Architect Corporate (and above) editions so that it seamlessly connects to a variety of integration modules, including: Jira, TFS, Wrike, DropBox and ServiceNow. With more planned in the future. Integrations offer support for linking Enterprise Architect elements to objects and elements within external systems. Included in the list of integrations is an integration capability with another Enterprise Architect project. This allows modelers, teams and organizations to view common information in a model and reference it from another Enterprise Architect model. 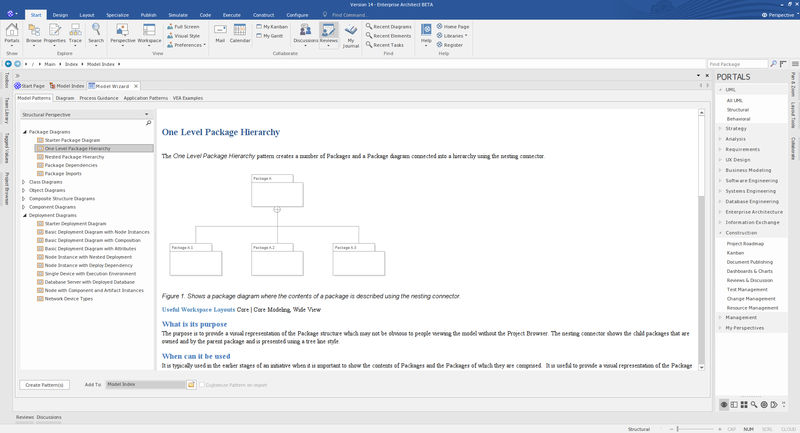 For example, you can now store organizational structure, deployment maps, requirement sets or other independent sets of information, in separate models and cross link new models to existing external content. You can even post discussions and make comments on the external Enterprise Architect elements where appropriate. One of the most interesting integration points supported by the new cloud based Integrator is a connector for other Enterprise Architect Cloud Based projects. 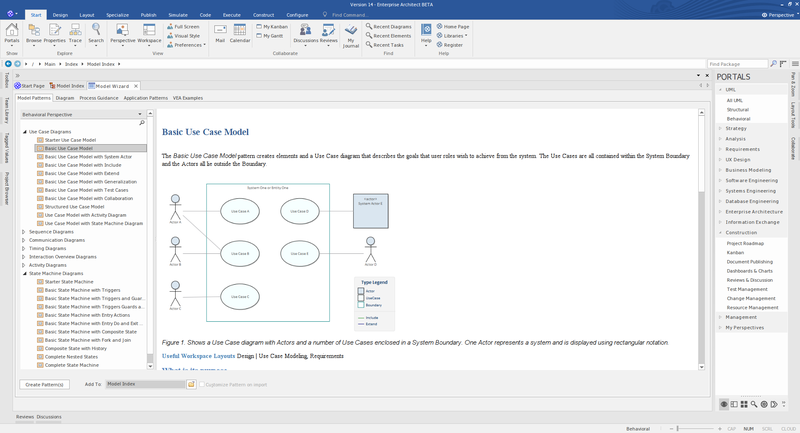 This immediately opens up the possibility of partitioning Enterprise Modeling assets across multiple models and providing cross references and linkages between models that allows modelers to develop new scenarios and projects that reference core and related elements and information from multiple existing models. Support for Wrike over HTTP - part of the new PCS integration system. Sparx Systems are also offering a Jira plug-in for the Pro Cloud Server and Enterprise Architect 14. Together these products make it easy to cross link and manage development using a combination of Enterprise Architect and JIRA tool sets. Microsoft Team Foundation Server integration is now possible through the Cloud based server integration module. 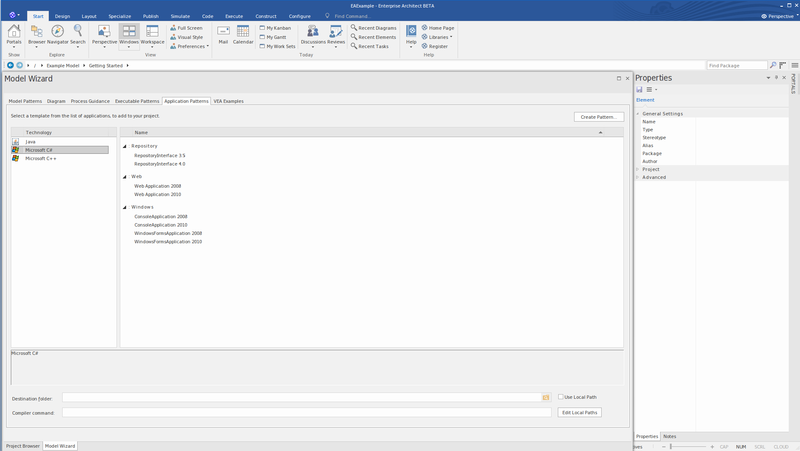 Along with other popular service based platforms, such as Jira and Service Now, TFS integration into Enterprise Architect provides a convenient and powerful way to link information held in various services, back to core modeling and design elements within the Enterprise Architect repository. 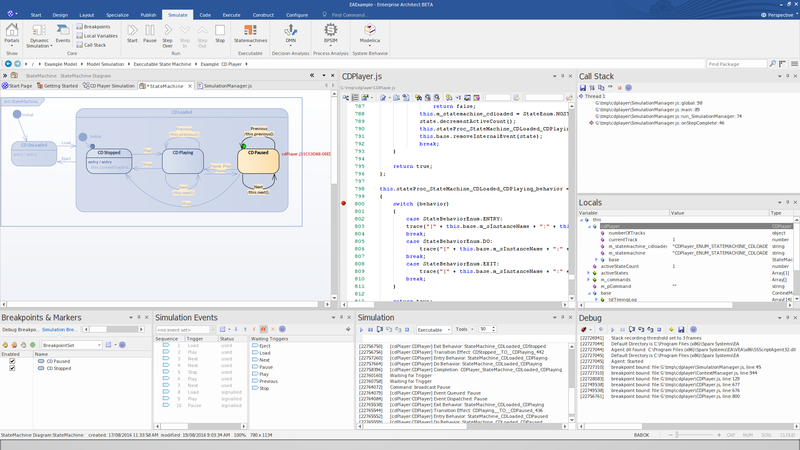 Built from the ground up, the new support for DMN is extremely comprehensive providing modelers with an exciting and tightly integrated new feature that supports rule based decision modeling in a standards compliant manner and allows for various simulations, integrations and code generation outputs that make the feature both useful for defining rules and for generating the implementation code to evaluate those rules. DMN supports the notation, hierarchical rule sets, and highly effective, specialized editors to manage and evaluate rule sets. Configuration tools and more allow the modeler to integrate DMN sets within simulatable state charts to procedurally govern state changes according to DMN defined rule sets and hierarchies of rule sets. The language was designed to work in symbiosis with BPMN but you can use it to model system decisions in a wide range of other languages including UML, SysML, SoaML, Code Engineering to name a few. The new roadmap profile has been added giving multiple pre-built diagrams that will allow for easier modeling of roadmap diagrams. Roadmap elements will now scale when the timeline is scaled. Version 14 is now compiled with Microsoft Visual Studio 2017 to ensure ongoing support for critical issues/patches and security updates issued by Microsoft. Both the Cloud Server and Enterprise Architect have been moved to the latest version to ensure the best performance and security on Windows based platforms. Systems Engineering and Business and Software Engineering editions have been joined together into the Unified Edition. This includes many new capabilities and a rich palette of patterns and useful tooling. The four versions and their floating equivalent will also come with a price restructure. Pricing details to be announced. From version 14 and onwards, Enterprise Architect requires that you 'activate' the Software Version you have installed by entering a simple four-letter code confirming your right to run a specific version of Enterprise Architect. 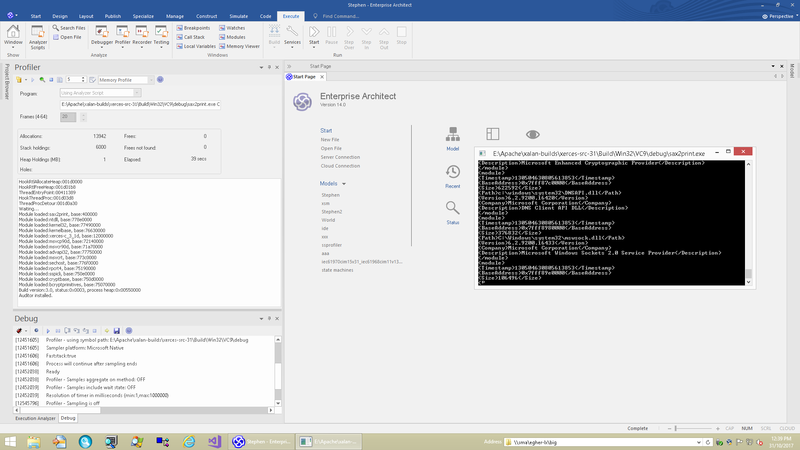 When you first run Enterprise Architect, a Version Activation window will automatically display, prompting you to activate the software version you have installed. For more information see the help. At Sparx Systems' discretion, we are planning to implement a three year rule when it comes to the renewal of licenses. If a license has not been renewed with a maximum three year period since its date of purchase, it will no longer be eligible for renewal, and a new license will have to be purchased. Did you know that you can purchase up to five years of renewals in advance? This allows for easy budgeting and funding, as one transaction could last the entire lifetime of your project. Contact our sales team to discuss your licensing needs today.